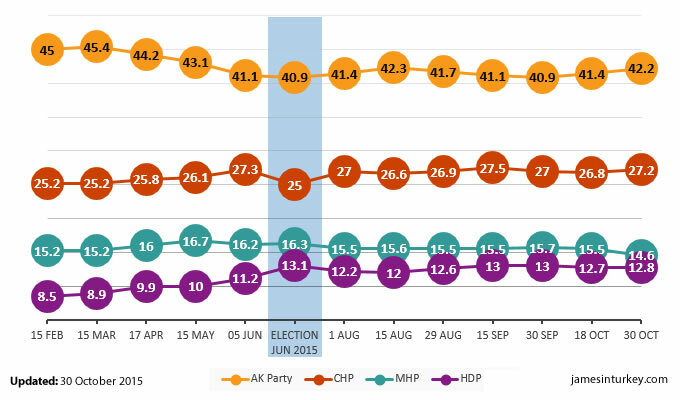 The James in Turkey rolling average records opinion polling ahead of the 1 November general election and charts the change in results. This page tracked Turkish opinion polls and how they have been shifting ahead of the general election. What it does do is maintain a rolling average of the last five polls published by known Turkish pollsters. It weighs this result down with the previous five polling results, which helps give an idea of the trend in support while protecting the average against extreme outlier results.